my scandinavian home: How white would you go in the home? How white would you go in the home? 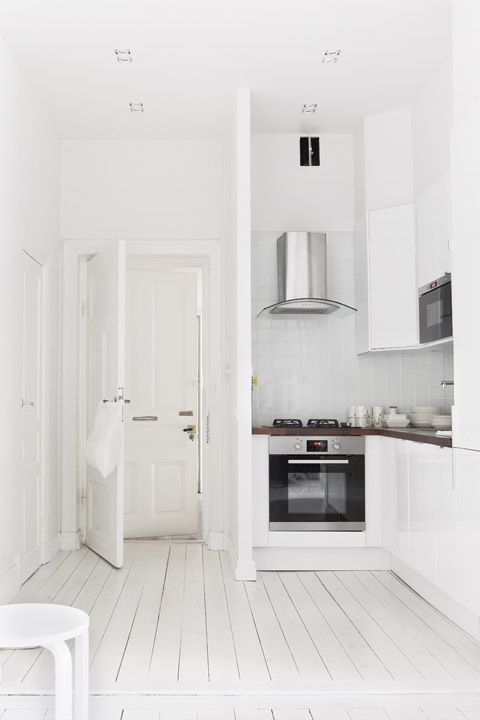 I know Scandinavian homes are synonymous with white, and yesterday's home was pretty white, but the interior designer behind this Swedish apartment has taken things to a whole new level! The floors, walls, furnishings, just about everything - is white! This isn't perhaps a very realistic way to live - as someone once commented here on the blog - 'own a rubiks cube and your stuffed'?! The home has of course been staged for sale through Fantastic Frank - sometime ago) but it's still inspiring in many ways - for example look at the difference a simple cream blanket makes on crisp white linen sheets - so calming. The kitchen is also lovely with a touch of dark wood and black. I guess the key question is, how white would you go?! I could definitely go for that all white bedroom - so peaceful! How about you? Get the look - Pick up beautiful stone washed white linen bedding here. This vintage off white blanket is similar - If sold (hurry, there's only one!) I also love this chunky Ecru blanket - it would look so pretty against white sheets. I have to admit, I have a real weakness for white. One of my friends had an all white wedding and all the guests wore it - it was such a beautiful wedding! I also love the white wedding dress and bridesmaids dresses at this rustic barn wedding (any excuse to indulge in a little wedding photography - and this bohemian wedding does look so romantic (and moving)?! Other white, white, white homes include this serene home of a designer (love the courtyard) and a calm swedish apartment. 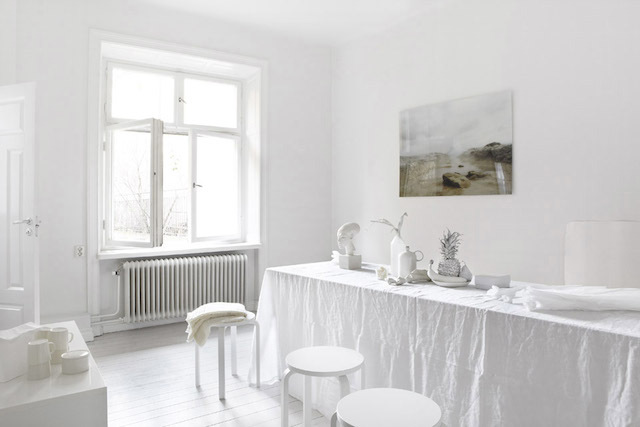 And (yes, you guessed it) I have an entire archive dedicated to white homes - this is a Scandinavian Home blog after all! Scroll passed the first home as it will be this one. I think it's too much here... that living room reminds me of asylums/madhouses, where everything has to be so controlled and clean and... not spontaneous. The best part to me is the kitchen - where I do like the clean feeling - but other than that... I need the personal, customized pops of color! 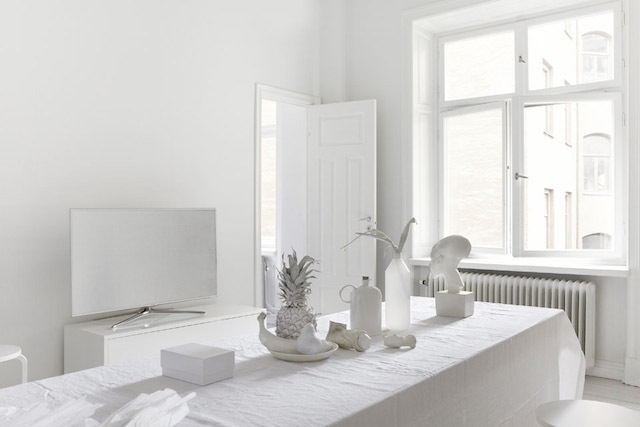 As much as I love white, an all white home would feel rather sterile... plus i'm not willing to give up on colours! The living room, I agree is a bit much. I am intrigued as to how the TV screen is colored? Too white for me. I always wonder with these "extra white" interiors, where do these people keep their books, children toys, etc? Are they all staged? That crisp white linen! Beautiful. If only I didn't have a dog! Oh my...I do love white but this is pushing just a bit..it feels cold and off putting to me...when all the accessories are white I think you have gone a wee bit over the top!! Would go far! All my walls and floors are white and most of the furniture. Unfortunately due to I live in a rental, the doors are not white, which is a real eye sore. Adding some color and all the greens in the windows from outside is balancing out too 'much white' (if this does exist LOL). I, too, find it a bit too much ..... it feels a bit too sterile, too lifeless. Having a bit other neutrals (like beige, gray or black) adds texture and drama, for example like the wonderful soft-looking blanket in the Dutch boudoir higher up that I need to hunt down right now.